length, also impedes the relaxed playing on a full size guitar . Obviously this affects frequently women, but men can also have problems with the ergonomic handling of a guitar with the typical scale length of 65 cm. A too large guitar body can cause problems with the right hand, and thus also with the attack and in the classic position the guitar can be played only with difficulties. What does scale length mean? The scale length is the length of the vibrating string. This means measuring the string from the bridge (on the top) to the nut (at the headstock). The size of the guitar body is always proportional to the scale length . So a guitar with a smaller scale length goes along with a smaller body, if it is built in accordance with luthier's rules. The balanced relationship between scale length and body size is important not only for the playability of the guitar, but also for a balanced sound. 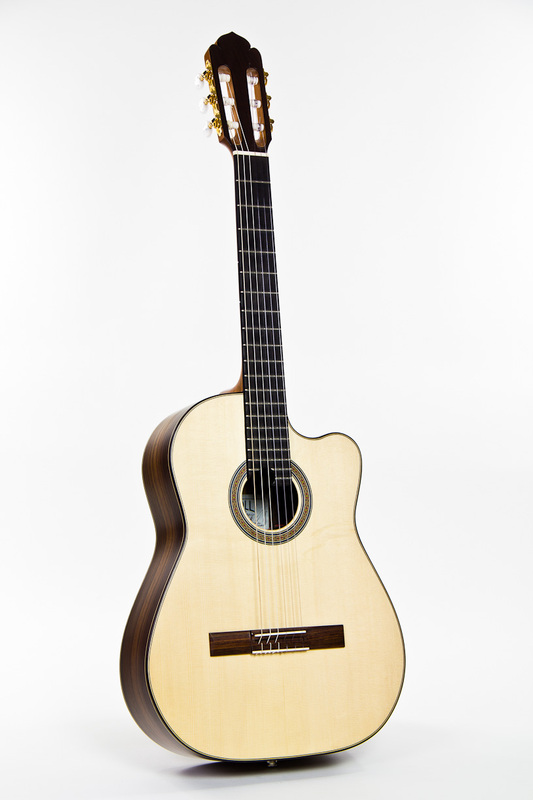 Only with a proportional reduced body sound hole and bridge are optimally placed. Only the diameter of the sound hole and the neck width shall not be reduced in the same proportion as the whole guitar. 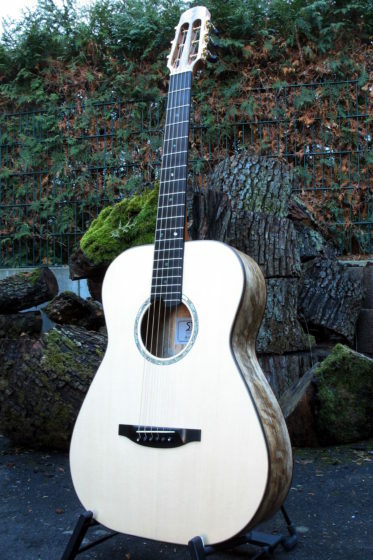 Is the sound hole too small, the guitar can sound highly compressed or boxy or just dull . The neck should not be too narrow to provide enough space between the strings. If the guitarist has only small hands, the body can be left at standard size and only the neck has to be adjusted. A slightly narrower fingerboard can help. Much more often, it is of great importance to adjust the neck profile. 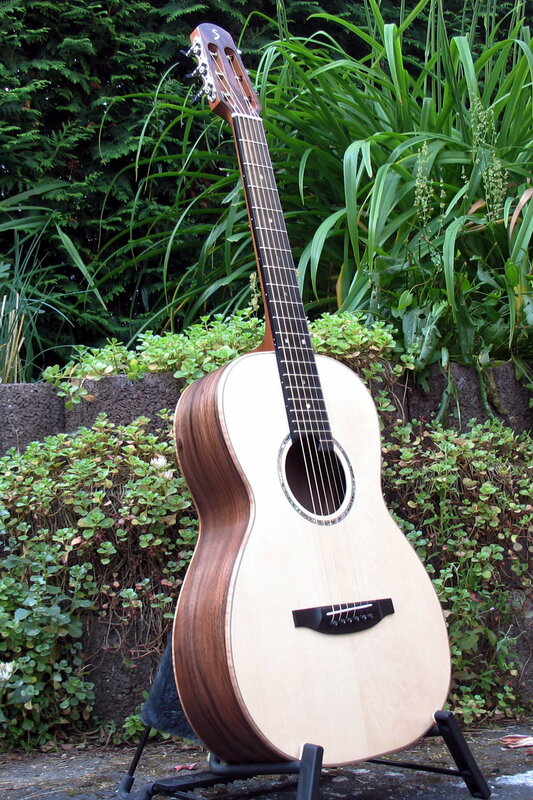 To shorten the scale length by placing a capo on the 3rd fret would reduce a 65 cm scale to 54,5 cm. But this would be of no help for a smaller sized player. His or her problem would be the still large body and the relatively wide and thick neck. In this case, the solution is a smaller guitar. The body of the guitar has to be scaled down in the same ratio as the scale length, because petite guitarists have a shorter torso and shorter arms too. It is advisable, depending on body size, to use scale lengths of 64, 63, 62 or even 61 cm. We meet the demand, mostly of women and juveniles, and offer our entry-level classical guitars like Primera and Estudio always with 65 cm or 63 cm scale length, often the Alegra or Classic Line I as well and with steel string guitars our Parlor model and the Ambition Fingerstyle. However, all our models are available in any scale length. Next article:When Should I Change the Strings of a Guitar ?